In the opinion of Will Friedwald, the Boswell Sisters–Martha (1905-1958), Connie (1907-1976), and Helvetia (Vet) (1911-1988)–are “the greatest of all jazz vocal groups” (Jazz Singing: America’s Great Voices from Bessie Smith to Bebop and Beyond [New York: Scribner’s, 1990], 156). Though designating anything that lacks an objective standard of measure as “the greatest” mainly indicates personal preference, Friedwald, who is as knowledgeable about jazz singers as anyone, gives good reasons for his opinion. He is not alone in valuing the sisters’ music. 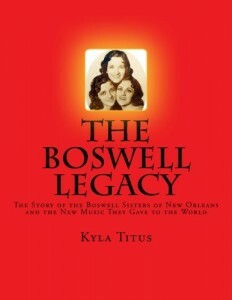 According to the Encyclopædia Britannica, the trio ranks with Lambert, Hendricks, and Ross (established in 1957) as “the two greatest jazz vocal groups of all time” (http://www.britannica.com/EBchecked/topic/764573/the-Boswell-Sisters; accessed 30 November 2014). In other words, the Boswells are highly regarded by the cognoscenti. They are also largely unknown by more general music lovers, despite efforts by the Pfister Sisters (who are not siblings) and a few other groups to perpetuate their kind of music, as well as the holding of the Boswell Sisters Centennial Celebration in their hometown of New Orleans in 2007 (when Connie would have turned one hundred) and a weekend celebration sponsored by the Historic New Orleans Collection in October 2014. The second of these tributes was organized by Kyla Titus. In order to draw attention to the sisters, Titus wrote The Boswell Legacy. Its title page identifies the authors as Titus and Chica Boswell Minnerly. Titus graciously acknowledges Minnerly, her mother and the daughter of Vet Boswell, because in 1989 Minnerly and David W. McCain started writing a text that, after they abandoned it, ultimately evolved into The Boswell Legacy, thanks to Titus’s efforts. McCain wrote the introduction to the book. Minnerly also maintained a Boswell archive, the source of much if not most of the information Titus presents. Titus’s seemingly authoritative account of the sisters’ lives and careers may be summarized as follows. Because the siblings grew up in the same household and lived and traveled together even when they were most popular, their biographies are similar until the mid 1930s, when the Boswell Sisters disbanded. Musically precocious (as was their brother Clydie, born in 1900, who died of influenza during the 1918 pandemic), they had private music lessons (classical) and, by the late 1910s, performed locally as instrumentalists. Martha played piano; Connie, saxophone and cello; Vet, banjo, guitar, and violin. They discovered syncopation and soon used it in their playing. They might have been susceptible to it because their father, A. C., a former showman, was familiar with black music and could play ragtime piano. Jazz cornetist Emmett Hardy became their friend and inspired them. They attended numerous musical performances, including at the Lyric Theatre, which featured such black singers as Bessie Smith and Mamie Smith, who became major influences, especially on Connie. By the mid 1920s, they added singing to their act; reaction to it caused them to forsake their instruments and become a vocal group, though Martha served as accompanist. They recorded for the initial time when they were nineteen, seventeen, and thirteen, respectively. The Boswell Sisters’s existence was threatened when Martha married in 1925 and gave birth to a son the next year; the crisis was averted when Martha continued practicing with her siblings, she soon divorced her husband, and family members tended to the child. The group toured on the vaudeville circuit, appeared in movies, performed regularly on radio, and recorded frequently. Problems arose in 1930 when Harry Leedy, who was enamored of Connie, succeeded Martha as the sisters’ manager and began promoting Connie more than the Boswell Sisters. Nonetheless, he managed the siblings during their most productive and rewarding years. Their fame was such that they had an audience with President Hoover, twice toured Europe, and made more movies. They broke up soon after a recording session in early 1936. This happened primarily because Connie wanted a solo career (which proved successful), though she attributed the demise to her sisters’ domestic realities. By then, all three women were married: the families lived in Toronto (Martha), rural New York (Vet), and New York City (Connie, who married Leedy). Titus concludes her book by briefly summarizing the siblings’ post-group lives. Titus clarifies two matters relating to Connie that have not been fully understood: the cause(s) of her paralysis and why the spelling of her given name changed. At age three, she was injured in a wagon accident and later had polio; as a result of these events, but apparently mostly because of the second, her legs were paralyzed, though she lost all ability to walk only after falling from a window at age twenty-two. This infirmity explains why she performed seated. It also accounts for her developing considerable upper-body strength, as may be observed in a photograph of her, around age eight, hanging by one hand from a ledge of the family’s house. (The text is enhanced by many photographs.) Connie quit dotting the “i” in her name in order to save time when signing autographs circa 1942; the spelling therefore appeared to be Connee, by which she became known. The modification was, in a sense, accidental. Despite the thoroughness of her book, Titus introduces some topics for which she provides insufficient information. For example, she demonstrates that for a long time Connie and Leedy had strong feelings for each other. Because Connie lived with her sisters during this period yet was in frequent professional contact with Leedy, one would like to know the nature of the couple’s personal relationship and how it worked logistically, since she could move about by herself only in a wheelchair. Perhaps Titus does not address the romance because it is not documented. If so, her refusal to speculate is admirable. When writing about a 1955 photograph of the siblings, the author states that by then the lives of Martha and Vet were “isolated and lonely” (8), but does not substantiate the claim, especially about Vet. Further, she mentions “a bitter legal fight over [Martha’s] estate” (180) without providing particulars, such as the issues or parties involved in it. Though Titus’s prose is adequate, she uses words that do not allow for exception when there are exceptions, as in the constructions “the two sisters went everywhere together” (18) and “she and her mother were constantly at odds” (36). She suffers a lapse such as this: “Jimmy Fazio . . . knew whom they were” (9). She uses clichés, including “the families heard the call of the west” (14) and “his worldly charm” (15). A copy editor would have caught the infelicities, but Titus, who probably paid for the publication of the book, cannot be blamed for not having one: copy editors are expensive. These and other prose shortcomings do not lessen the value of The Boswell Legacy. Immediately before the epilogue, Titus refers to the gloriousness of the siblings’ creations and asks readers to “listen to the music and see if [they] do not agree” with her assessment of it (186). This is good advice because Titus discusses the music so little that one cannot conclude much about it from her text and therefore cannot comprehend why it was so popular. In only a few instances does she characterize the group’s sound: “in the trio’s arrangements, the sisters always made space for the musicians to play solo spots, with room to do their own thing without interference. They were masters of improvisation—the cornerstone of jazz” (112); “they received hundreds of requests for their arrangements, which, aside from their exceptional timing and voice blend, were central to the ‘Boswell Sound’” (117); and “they were close harmony singers and needed to keep the sound soft and intimate” (120), which is why they used a microphone during live performances. (“Between the Devil and the Deep Blue Sea,” “Got the South in My Soul,” and other tunes disprove the author’s statement that all the siblings’ recordings feature instrumental solos.) She notes that the sisters created their arrangements by working backward from the end of a chorus. Observations about their music in quotations from two published sources are more substantial than Titus’s own: in a 1937 number of Billboard, a writer claims that the siblings introduced variations on the first chorus in the second one, a technique many popular singers soon adopted; in an article published in 2008, James Von Schilling focuses on the sisters’ performance of “Crazy People” in the 1932 movie The Big Broadcast, though his commentary is descriptive, not analytical. While the book’s subtitle indicates that Titus will tell “the story of . . . the new music [the siblings] gave to the world,” she does not do so effectively. A few substantial paragraphs or a brief chapter about the quality of the sisters’ music would have been helpful in this regard. Though Titus specifies improvisation (by the likes of Bunny Berigan, the Dorsey brothers, Benny Goodman, Manny Klein, and Joe Venuti) and close harmony (probably absorbed while growing up in a family that featured barbershop quartet singing by the parents and an aunt and uncle) as hallmarks of the sisters’ music, she overlooks the Boswells’ energy, which helped elevate their creations above the mostly staid popular music of the time. (Among contemporaneous vocal groups, probably only the Mills Brothers came close to the siblings’ inventiveness and musical accomplishment.) Further, the sisters’ music is distinguished by an appealing irregularity of tempos, keys, and accents. Fortunately, readers interested in the Boswells’ music can easily honor Titus’s request to listen to it by accessing it—and viewing some of the trio’s movie appearances–at youtube.com. There, one special treat is a scratchy recording of “I’m Gonna Cry,” from the sisters’ initial recording session (1925). It is a feature for Connie, whose singing seems derived from blues singers she heard as a youth. She had a large, powerful voice—though less so than Bessie Smith’s, for example–which is evident here as she belts out the song. During a chorus, she sings in the manner of an instrument, with Vet providing harmony. Someone listening to this performance unaware might well think Connie black and confuse her with one of the classic blues singers. One would likely be surprised to learn that at the time of this recording, she was only seventeen. In sum, Titus has written a valuable book. Because it is based on archival research, it is the most reliable source of information about the sisters’ lives and careers. Though the author largely ignores the nature of the siblings’ music, readers can enjoy and evaluate it by accessing it on-line. Reading her study in conjunction with listening to the music will lead to an understanding of the sisters’ innovations and of why the group was so popular and influential. 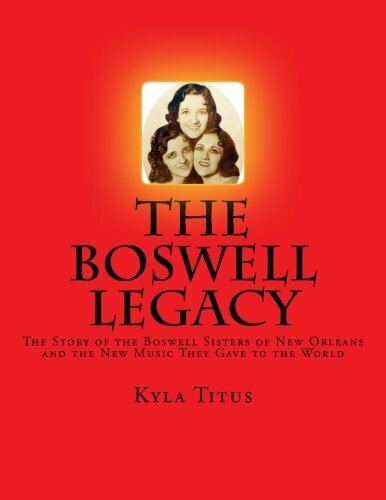 The recordings of the Boswell Sisters are of lasting value, as is The Boswell Legacy.